Grassley tacks on Supreme Court appointment - Combat! Senator Charles Grassley is the most Iowa man in Iowa. He’s 82 and has aged in the Iowa manner, by looking like a child who fell into a food dehydrator. His Twitter is a delight. He is a Republican in the Chamber of Commerce tradition, representing that wing of the party whose ambition for government is to get it out of the way of farmers and insurance agents. This approach has gotten him labeled a Republican In Name Only, which is the kind of accusation people who learned about politics from Glenn Beck will level at a man who has been in the US Senate for 34 years. But despite the certainty that he will spend the rest of his life in office—or maybe because of it—Grassley displays the most Iowa quality: he wants to do a good job. Yesterday, he announced he might hold hearings on President Obama’s Supreme Court nominee after all. His decision may have something to do with this jeremiad in the Des Moines Register. [I]t appears the Senate may choose to not even consider the nominee, whoever that will be, by refusing to bring the issue to a vote. There’s only one explanation for this sort of obstructionism: Politics. Politics, you say? Not quite a wild surmise. But it was enough to goad Grassley into action, which is the Iowan word for risk management. He didn’t say that he was going to let Obama’s nominee out of committee for an up-or-down vote. He didn’t even say he’d hold hearings. He said he hasn’t ruled it out, which tells us little of his future plans. It does tell us of his present state, though. 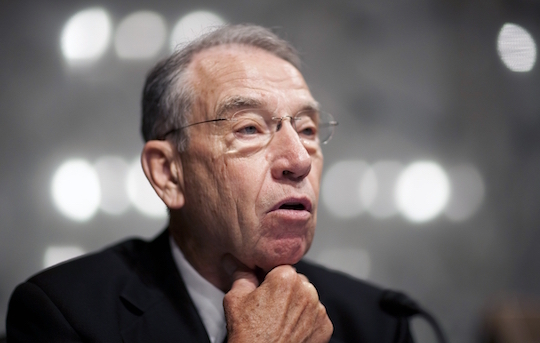 At the end of his career, Senator Grassley finds himself chairman of a minor crisis. And he is not going to simply do what he is told. He’s going to carefully consider, by his own lights, whether to do what he is told. Probably he will decide yes. Who wouldn’t choose (relative) harmony during his least years in the world’s greatest and lately most contentious deliberative body? Iowa values team play. But it’s nice to see him reserve the right to do what he thinks he ought to. Senator Grassley is a powerful lich, but somewhere in that desiccated body, warm blood moves.